Christmas is an exciting time for all children, but it can be difficult for those escaping domestic violence. While kids all over the country receive dozens of gifts during the holiday season, children living in refuge may not even expect to have one. Having already left their home, toys and all that is familiar, we at KidsOut believe that these children deserve more and through Giving Tree work to give them a Christmas to remember. 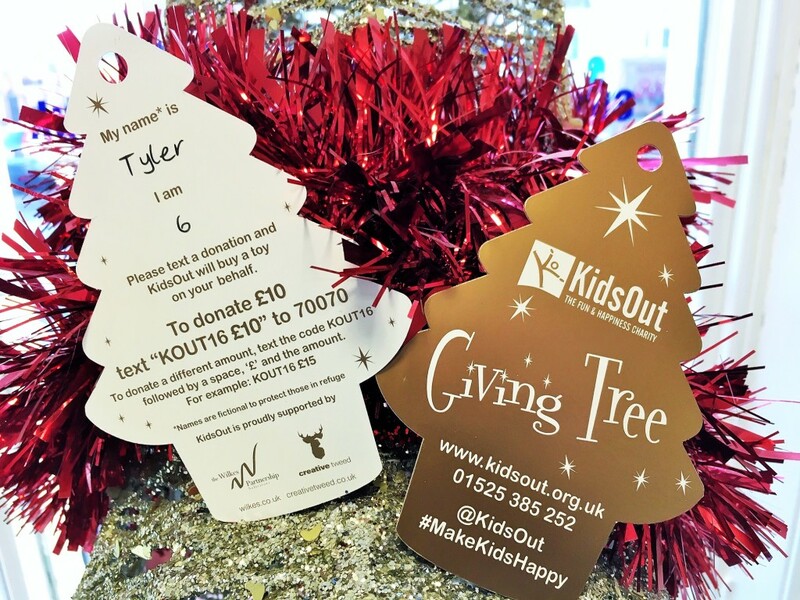 Through the Giving Tree KidsOut are able to distribute a toy to every child living in a Women’s Aid Federation refuge during the festive period throughout the UK. It’s so easy to make a difference, simply pop into the Peterborough Marriott, collect one or two tags from the trees and return sometime before the 14th December with the gifts and tags, unwrapped for health and safety reasons. Everyone ‘giving’ to us will receive a selection of goodies including a complimentary hot drink, selection of discount vouchers and a free mince pie, kindly donated by Greggs. All donations will be collected by the charity on the 18th December and all contributors will be invited for a photo opportunity.